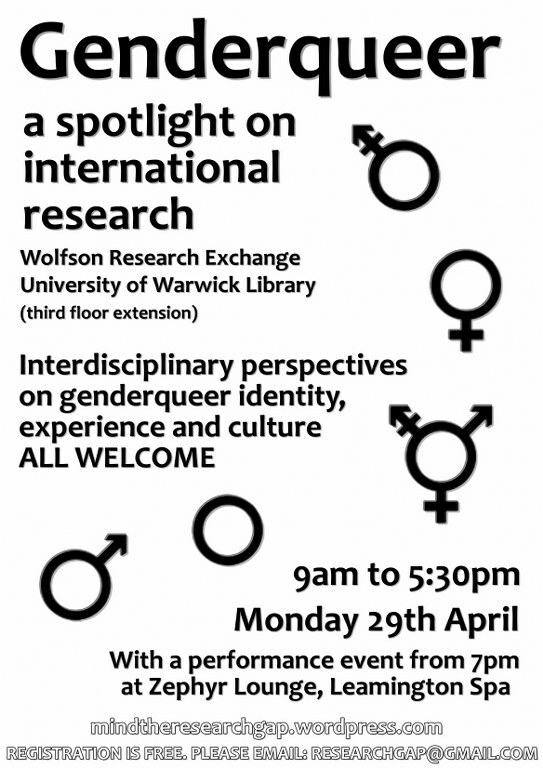 It’s now less than a week until the Spotlight on: Genderqueer event takes place on Monday 29th April. We still have a handful of places left, so it’s not too late to register – if you wish to attend, please email us: researchgap@gmail.com. If you can’t attend in person but have access to a decent Internet connection, you will be able to livestream the event. We will be streaming for the duration of the event, from 9am to 5:30pm British Summer Time (GMT+1). We encourage remote participants to join in the discussion via Twitter. We will have a Twitter board in the room so your thoughts, comments and questions will be visible to physically present speakers and other participants. A provisional programme for the Spotlight on Genderqueer event is now available. It is also possible to register if you wish to attend in person. We will also be livestreaming and tweeting from the event: further details of this will be announced soon.